This song booklet contains nine different songs, including "America the Beautiful," "The Star Spangled Banner," and "America (My Country 'Tis of Thee)"
This is a clip from Season 4, episode 10 of the ABCFamily show Lincoln Heights. In this clip, Tay Sutton is performing a song he wrote for his brother who is a veteran. The song is called "We'll Fight For You." 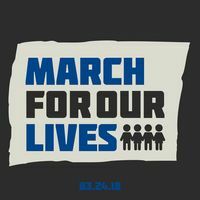 Ben Platt & Lin-Manuel Miranda "Found Tonight"
Music Video for the song "Found Tonight" by Ben Platt and Lin-Manuel Miranda for the March for Our Lives. 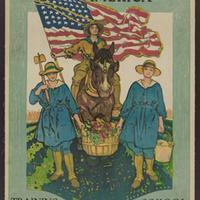 The Woman's Land Army of America--Training school, University of Virginia--Apply Woman's Land Army, U.S. Employment Service, Richmond, Va.
Two women carrying basket of vegetables in front of woman in uniform on horseback with U.S. flag. 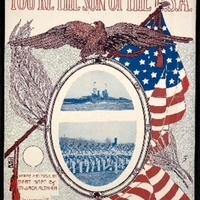 This is the sheet music for the song "You're The Son of The U.S.A." by Bert Haft and Jack Altman. This song was published by H.A Music Publishing Company in Bridgeport, Connecticut. 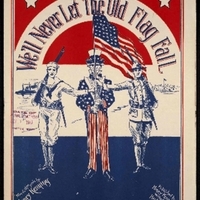 This is the sheet music for the song "We'll Never Let the Old Flag Fall" by Henry Kenning. This song was published in Hartford, Connecticut. 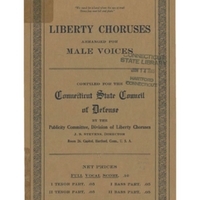 This is the sheet music for the song "My Son, Your Country Is Calling" by Milton Charles Bennett. It was published by Bennett in Hartford, Connecticut. 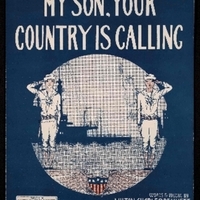 "Over There" is one of the most iconic patriotic songs written in the United States during World War 1. 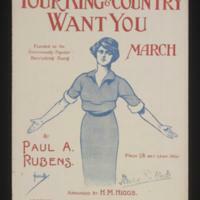 This is the poster for the song "Your King and Country Want You." This song was popular in music halls in Britain during World War 1. Women would sing it in order to get men to sign up for military service.